Since Google+ made it possible to share your circles with the public, it has opened up a whole new avenue of finding and recommending interesting people on the social network. The problem with the method that Google+ offers is that the shared circles can easily get lost in your posts. Since the only way to share your circles is to post them directly to your profile, we’ve uncovered a few ways that Google+ users can dig out all of those interesting shared circles. Shared circles isn’t the only recent Google+ feature you can use to find interesting people to circle. Google+ Ripples have also proved to be an easy and fun way to discover influential users on Google+, but more on that later. Chris Porter is curating a list of all of the shared Google+ circles, available in a Google document, which we shared with you on Google+ earlier this week. The list is huge and still growing, with over 800 circles shared with the public. There is something in there for everyone with recommended lists of bloggers, photographers, writers, authors, entrepreneurs, CEOs, celebrities and much more. If you want to contribute your shared circles to the list, check out the guidelines here. The easiest way to find out who’s sharing circles with you is to simply search for it – this is a Google platform after all, isn’t it? Go to Google+, and search with the term “shared a circle with you“. You’ll find all the recommendations available on Google+, shared either with circles which you’ve been added to, or shared publicly. If you want to see recommendations made by a specific person, just add their name to the search. So for example, if you wanted to see the circles I’ve shared with the public, you would search for “Nancy Messieh shared a circle with you“. Before Google+ made it possible to share your circles publicly, Jarek Kimek came up with an interesting alternative called the Public Circle Project, where you list your favourite Google+ users in your About page. There’s no reason you can’t continue to use this method to really highlight your absolute favourite Google+ users on a static page. Since shared circles can get lost in the midst of your posts, you can use this method to tell your new followers immediately who you think they should be circling. Imagine I’ve just circled you. This means I like you, and I’m open to hear your recommendations, especially if I’m in my explore mood and I’m looking for new names for my circles. So, the project gives a nice additional exposure to the people you like. You can use this method to share a direct link to a post in which you shared an interesting circle so that it doesn’t get lost in the noise. There is truly no limit to how Reddit can be used, or the kind of information you can find on the site, so it’s not at all surprising that there’s a sub-reddit featuring a small list of shared Google+ circles. While the list has not been active in a couple of weeks, it serves as a great place for users to easily share their recommendations in one place without having to wait for someone else to add the shared circle to a list. Also, there’s no reason a site like ListGeeks can’t be used to create one big collaborative list of interesting circles on Google+. An easy way to find influential users is to use Google+ Ripples. 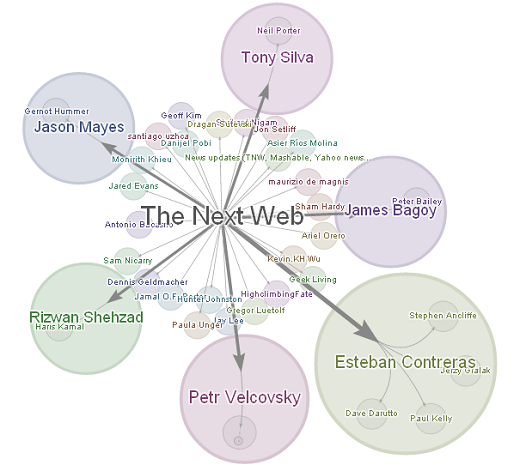 Ripples make it easy to find the heavy hitters on Google+ who are sharing interesting posts. So let’s say you wanted to see who shared one of The Next Web’s latest posts on Google+, you would just check out the Ripple page for that post, making it easy to see the influencers who have shared the post, along with everyone else. Ripples make it incredibly easy to find users who are sharing content that you already know you’re interested in. With Google recently acquiring Katango, it may add an interesting dimension to Google+ circles, making it easier to organize your circles for sharing. Oh, and if you’re looking for a list of The Next Web team on Google+, the shared circle is available here. Do you have any interesting tips or tricks on how to find interesting shared circles on Google+? Let us know in the comments.